Each year in the U.S. there are more cases of skin cancer than the combined incidence of prostate, breast, lung and colon cancers. One in five Americans will have skin cancer in their lifetime. While most of us now recognize the dangers of sun tanning, for many of us the damage has been done and we are now in a position of watchful monitoring for skin cancer and seeking skin cancer surgery when needed. Dr. Nicholas Bastidas is a plastic surgeon for children and adults and his reputation for successful skin cancer surgery and reconstruction is widely known. As a plastic surgeon, Dr. Bastidas will focus on a complete removal of cancer cells at the same time that he will use techniques that minimize scarring and restore your normal appearance. Clearly the oncology results are critical for the long term care of patients, but Dr. Bastidas' additional plastic surgery skills will also maximize cosmetic results securing optimal outcomes after skin cancer surgery. The diagnoses of basal, squamous cell and melanoma call for different methods of skin cancer surgery and surgical margins. Other factors in determining the type of skin cancer surgery that Dr. Bastidas will perform include how large the cancer is and the location of the cancer. In most instances, Dr. Bastidas is able treat his patients with skin cancer surgery in one of his offices under local anesthesia. This means a simple injection of anesthetic can be given while you undergo a painless procedure. While the diagnosis of skin cancer is difficult for patients, Dr. Bastidas is able to utilize cutting edge techniques that can bring about successful results in terms of cancerous cell removal and cosmetic results. 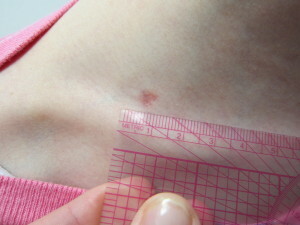 Skin cancers are excised in the office with appropriate surgical margins and the wounds are then closed using meticulous plastic surgery techniques. The scar is often longer then the actual cancer, since excisions are often performed as an ellipse to allow for tension free skin closure and good anatomic contour. Dr. Bastidas performs his skin cancer surgery reconstruction using a combination of dissolvable internal and external sutures. Multiple layers of tissue are re approximated to facilitate excellent healing throughout the newly closed wound. All specimens are sent to the pathology laboratory for a thorough evaluation. Results are obtained typically within 5-7 days and are often provided to you at the first post-procedure visit. A copy can also be sent to your primary care physician and/or dermatologist. A personalized approach is used to tailor the reconstruction for each patient depending on the size of the defect, location, scarring history, skin type, and type of cancer. Primary closure, skin grafts, local or regional flaps may all be employed to close the wound and restore the anatomy. Adjunctive therapy such as steroid injections, pressure dressings, and silicone scar treatments are often employed as well as laser therapy. Some of Dr. Bastidas' patients benefit from Moh's surgery, a highly successful technique that is used to minimize the deformity and achieve cancer free surgical margins. Dr. Bastidas teams up with the best dermatologists who specialize in Mohs. Dermatologists who perform Moh's surgery have received special training in this technique involving removal of the tumor followed by microscopic examination of the tumor. If cancer cells are seen in the specimen, the doctor returns to the patient for further removal of cells, this process being repeated until the skin samples are free of cancer cells. At this point, Dr. Bastidas intervenes and reconstructs the surgical area with pleasing cosmetic results. Moh's surgery is frequently used in skin cancer surgery because of its minimal scarring and thorough removal of cancer cells especially in anatomic sensitive areas such as the face. If you have been diagnosed with skin cancer, please contact us to schedule a consultation. You can be confident that Dr. Bastidas and his talented team that will deliver safe, high quality skin cancer surgery with excellent oncology and cosmetic results.